Engagement is anchored to empowerment, and organizations need dis-un-engaged and dis-un-empowered supervisors in order to optimize performance and productivity. I say this simply because supervisors manage workers and workers do all the work and because data after data show that un-engagement and un-empowerment are two main themes of so many workplaces. And that writing started me thinking about the whole negative reality of tops-down, corporate “engagement” that my 40 years of business management work has never shown to work very well. The thought was that disrupting this approach might be interesting. 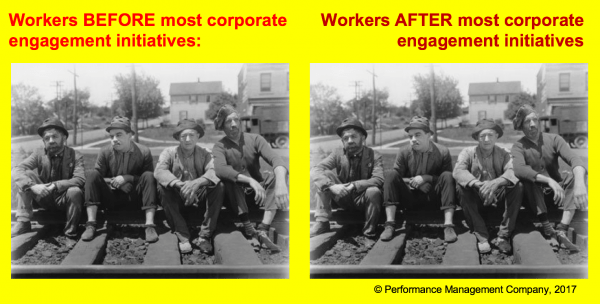 Corporate Engagement Hasn’t Worked – Why not try Disruptive Engagement? So, what IS Disruptive Engagement? Nothing fancy. It is simply about allowing the supervisors and managers to remove the things that their people perceive to be getting in the way of improving their workplaces. Often these are perceived roadblocks, more than real ones and Best Practices will show that the solutions are often already in place and working in isolated cases. Well, That got me thinking about what to actually do to accomplish this kind of initiative. The ideas already exist and it is more about developing a culture that does a better job of minimizing fear and optimizing discussions. But a reality are the issues of allowing the supervisors the time and ability to actually do things differently. There is simply so much task interference from meetings and reports and measurements and other factors to really allow them the coaching time or the time to facilitate implementation of ideas. What we need are good conversations and the improvement of facilitation skills to better actively involve workers. The solution actually does appear to be relatively simple and straightforward, if organizations really consider these issues of engagement, motivation, empowerment, innovation, and teamwork to be of importance. It sure seems like they are important, so why do we choose to not do things differently? We talk and talk and measure and measure and meet and meet but seldom have any direct contact or influence on the workers. Why can’t we do this? Why do I hate outdoor team building events? Because outdoors represents a basically impossible environment to do much actual team building yet companies choose to do those things, get no results and then think that no team building is actually possible. And they waste money, time and energy and cast a pall on good, impactful programs. With training outdoors, there are simply too many distractions and dissociations in how people are reacting to make good connections to workplace issues. Outdoors is simply a place full of distractions making it is hard to hear and easy to lose focus. Sure, who doesn’t like to go whitewater rafting*, but other than remembering the fun and a few crazy things that happened to a few people, does it apply to workplace improvement or innovation or discussing changes in expectations or alignment? And let me note that a lot of “indoor team-building focused experiential training experiences” are often simply outdoor-type activities moved indoors. I do not include any of those in my framing of business simulations and business teambuilding events. Running around indoors is the same as running around outdoors, in my view and I would also not consider paintball and firewalking to be indoor activities. The ROI on most of these activities simply cannot be measured. Sure people have fun and will talk about the experience afterwards, but will they really do anything differently to impact the organization? And isn’t that why we are doing team building in the first place? Organizations spend a LOT of money on team building events, with the expectation that they will get some return on that investment and see some changes in organizational behavior such as increased collaboration between departments or better alignment to the organizational mission and goals. (And, yes, “Interdepartmental Collaboration” is another favorite oxymoron!). Post program, you will find the attendees talking about the activity and the structure and not a lot about the debriefing or the business links. Navigating that high ropes challenge is a solid accomplishment. And, sure, solving The Acid River is an interesting challenge – now how does that relate either to solving interdepartmental issues? And, often, the solution comes from ONE individual and not the team – there is no real teamwork involved in the strategy and those not involved are often those same people who resist the changes being done to them. Being directed as to how to perform is NOT teamwork and will not improve collaboration. CAN Outdoor Teambuilding work? Sure. But DOES it represent the BEST environment for involving and engaging the broad diversity of people within the group and generate sufficient critical thinking or shifting of perspective that could drive changes in behavior? Organizations pay for this stuff, but I am not sure if they are looking for “great fun reactions” or actual impacts and changes. Only you can make that judgement based on your personal experiences, but my direct and indirect experience would say, Nope. No way. Generally, those kinds of activities offer no possibility of measuring or measurement of behavior of individuals or groups, unless you focus on timing, which is a focus on competition more than collaboration. They make it difficult for the older, less athletically-able people to compete on equal footing (that is a pun because I have a bad foot in actuality). The older workers simply cannot run and jump with the younger ones. The events are often exclusive to those with some kind of disability or infirmity, such as a bad back or shoulder or knee and, frankly, being an observer is simply reinforcing that they are different (and not included with the others). Doing a Dragon Boat Race is seemingly pretty unrelated to improving customer service or implementing the new strategy to involve and engage everyone in a workplace innovation project. Going go-kart racing is a fun thing, but who wins is often the most common discussion along with who had the fastest kart or who cheated so they could win. Do you have a different perspective? And there is Paintball. Paintball as a business exercise. Shooting at other people with hard projectiles with the goal of doing them harm (killing them out of the game?) but also demanding some high level of motor skills coordination and physical activity of running and dodging to succeed creates an unfair playing field. Grandmother Susan in accounting is probably going to find it somewhat physically challenging to lie in the dirt and shoot at people. This 30-second advertisement for Booking.com is an especially good one, I think. Click on the image below to watch it on YouTube – it is well worth the time (30 sec)! And I also still laugh at the Firewalking “training event” paid for by Burger King back in 2001, with 100 marketing employees participating in this “team building and personal growth” session. The result was that 12 people got their feet burned and Burger King generating a great deal of publicity — yes, even Dave Barry poked fun at them in an article and there were a ton of posts around “naming the event” in a couple of training discussion threads, as well as suggestions for potential theme songs like, “Light My Fire” by The Doors (grin) ). You can read more about firewalking here. Firewalking can be a legitimate (and costly) experience growth experience (www.skepdic.com/firewalk.html). but does it really impact teams and help to improve company results? …so the Big Benefit of Outdoor Training: You do not have to rent a hotel room. Sure there are things like whitewater rafting that need to be outside, but I encourage you to watch White Mile with Alan Alda (trailer is excellent!) about his mandatory whitewater trip and the death of some of his executive team. Sure, it is a movie, but being on the water is not really the cat’s meow for many people. I can go on and on about the personal experiences (generally failures and mediocre learning situations) but those have been done in prior blogs. What we are talking about is team BUILDING activities and not the team BONDING kinds of things that might improve friendliness or improve personal interactions but that have only remote connections to organizational development. You have alternatives. There are a lot of good team building simulations out there that focus discussions on issues and opportunities, programs that present actionable behaviors and cultural shifts in how things are done. So when someone is suggesting an event, ask questions about what might result from the expenditures. Define the desired outcomes and frame up with the ROI should look like. Good events can generate a lot of positive outcomes and impacts. 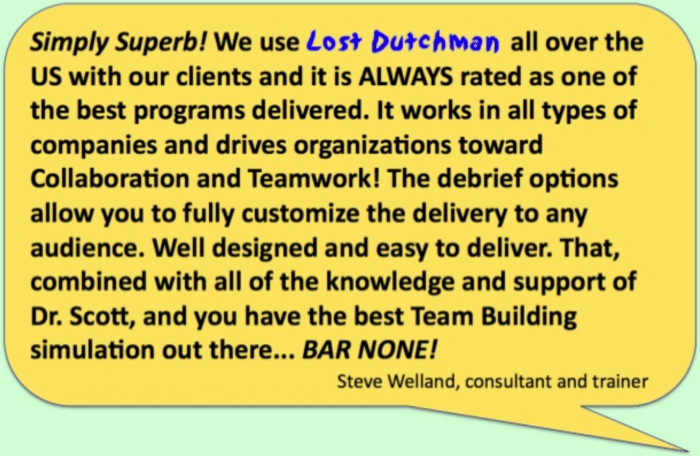 One of the best teambuilding exercises in the world, as rated by his users, is The Search for The Lost Dutchman’s Gold Mine, which focuses on leadership, collaboration, alignment and focuses on implementing the collective performance optimization ideas. My teams don’t want to attend a training program or offsite meetings; the programs aren’t exciting enough and they hardly learn anything from the programs. In fact I haven’t come across many effective programs that can keep my people engaged and make offsite meetings interesting! This was part of a conversation between two heads of an organization in India with my colleague Solomon Salvis. They were together to talk about a management development retreat and focused on teambuilding and one of these heads was quite reluctant to send his teams for any training sessions. He did not see value; he did not see impact. It was apparent that many of his past experiences showed such meetings to be fluff and low on the aspect of driving real change within his organization.And it is really too bad that such reactions are common with some many team bonding exercises that are presented as team building tools. 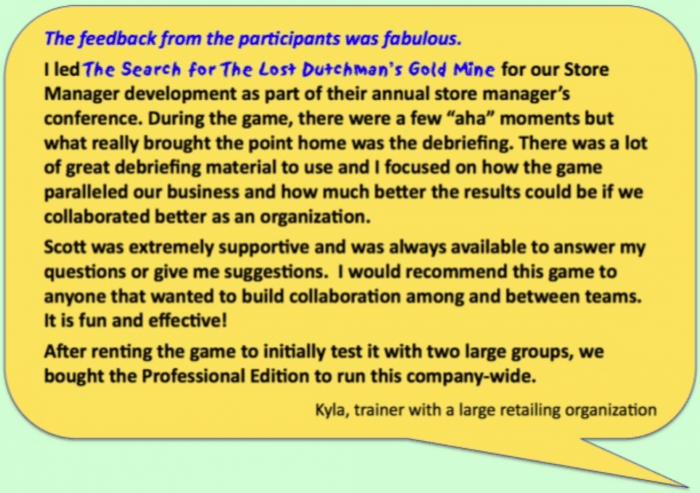 We designed The Search for The Lost Dutchman’s Gold Mine to be different, to make this business simulation challenging but also to change the behavior of participants. The difficulty comes from addressing the senior manager attitudes that events cannot be effective in driving new strategies or building real collaboration. I’ve received tons of positive feedback about the exercise – that it was the best one that they’ve ever done, it was fun and they learned something, etc. While I’ve always had an open door policy, people are using it more now – I have heard about more issues unsolicited in the last ten days than I had in the previous five months, which of course means I can do something about them. It’s been great. With Solomon’s explanation, the learning head from the above conversation invited his team to conduct Dutchman at 5 different offsite venues to focus on strategy, implementation, taking calculated risks, decision-making in short periods of time, trust of leadership and teams, and collaborating internally and externally for optimizing results. He then had the opportunity to debrief with the two business heads on impacts and outcomes. The Learning head had received a lot of praise for introducing simulations in the organization and thanked Solomon for putting in the effort to make offsite meetings interesting. The other head informed that the feedback from the participants has been highly encouraging, the participants were completely engrossed throughout the entire exercise, they loved the energy, the learning and the set up. Their teams are now more collaborative than ever before and are ready to take on big challenges at work. If properly focused and delivered, a well-designed team building simulation can provide measured results that can be compared to optimized potential performance and support a discussion around key learning points and the choices that were made and that might be made differently in the future. In many deliveries, the teams choose to compete with each other, which is energizing and fun but which actually sub-optimizes performance results. This same dynamic is why “interdepartmental collaboration” remains an oxymoron in many organizations. So, one goal of a powerful debriefing and program delivery is to discuss considered alternatives that could lead to improved outcomes. This can drive real change. You can reach Solomon Salvis at Simurise Learning Solutions in Singapore. These days, my focus continues to be on people and performance, with more consideration around The Supervisor and their work to dis-un-engage and actively involve their people in workplace improvements. I blogged last week about the concept of Free The Supervisor. If we want to improve engagement, the only people who will do this are the ones that have direct contact with the employees. All the rest is window dressing and no amount spent on surveys will accomplish anything without the vesting of those front line managers. The reality is that so many things get in the way of them doing anything differently. And I am actively collecting data in this regard, trying to identify some of the things they do that block them from doing new things. And a conversation with David Zinger of the Employee Engagement Network this morning got me thinking of one of those classic examples of this kind of meaningless required goop. Note: This actually happens to you, if you are a manager, but you call it something else and the names and faces are changed. I am working with one of the Bell operating companies working on the outside plant that supports the telephone wires and all that stuff. In particular, I am working with one of the supervisors and his manager and looking at ideas for impacting motivation and performance results. We have really good support from the management team to try to do some things differently and I have good access to the managers. So, early for a scheduled meeting and sitting in the District Manager’s office and talking with his secretary, I spy what looks to be an interesting series of notebooks labeled Hubcap Report. So, I ask her about them and she pulls the latest one down. Inside are a series of bi-weekly reports from all 12 garages listing the trucks with a check mark if they have hubcaps. Years of reports. Digging down, one of the former DMs in visiting a garage noted that some of the vehicles were missing hubcaps so he had asked the garage managers to get them fixed and to send him a report. That request became a process, done by each supervisor every two weeks, signed off by their manager and forwarded to the District Office where they were stored in this notebook. The current DM never even knew they existed and the secretary simply filed them, not knowing how silly they were to keep doing. How many of YOUR supervisors are completing reports and sending them upward, with no clear purpose and minimal impact? In this particular company, a total of 7,000 person-hours per year were spent in weekly executive committee meetings at which 11 senior staff members provided updates on the business to themselves. To prepare for these meetings, these senior staffers held 11 of their own unit staff meetings consuming 1,800 person-hours each, for a total of 20,000 hours per year. To get ready for the unit meetings, a total of 21 managers working for the senior staffers held their own meetings, 21 of them, for a combined total of 63,000 hours per year. Of course these unit meetings, being important, required “prep meetings” themselves, often involving supervisors. 7,000 hours: Weekly executive committee meetings. 20,000 hours: Weekly senior staff unit meetings. 210,000 hours: Weekly prep meetings for the staff to the senior staff. Help them to see out of the box they find they are in. Give them some perspective and even some hope that things may get better. And look for simple solutions to some of the issues. Look at the things you can eliminate. Stop doing the things that do not have real impact. Maybe even BLOCK some of the extra-departmental information requests that will have NO positive impacts on YOUR team’s results. It is simply so easy for someone in staff to ask for information and so easy to take up your people’s time with those requests. Start doing some active involvement. Start doing some team building — our Lost Dutchman’s Gold Mine activity is fabulous. Take a look at the communications and engagement tools at The Square Wheels Project. But whatever you DO choose to do, do something that will improve motivation and performance! Any kind of real collaboration and employee engagement at the front lines is likely being blocked by things that have little impact on your organization. Remember – The ONLY people who actually produce any income for an organization are the workers. All of the management function as overhead costs. And who actually manages the workers? Supervisors play an important role in the business environment. Their primary job is to see that the work performed by employees is completed on time and at the highest level of quality. In order to complete this task, they must know the production process and have an understanding of human behavior. Theirs is a pressure-filled job. It is their job to write reports, letters, memos, performance appraisals, and the gamut of documents that businesses need to operate. They must be equally comfortable in communicating with chief executive officers and assemblyline production workers. They must be able to run effective meetings. They must carefully monitor the organization’s goals, strategies, tactics, and production schedules. They must be cognizant of union rules where applicable. They must be trainers, confidants, computer experts, goal setters—in short, supervisors must be well-rounded employees who are willing to accept the responsibilities required to keep a company running. Supervisor as Human Resources Specialist. But, as I shared in other articles and blogs, and despite corporations spending billions of dollars in survey fees and executive and management time focused on improving active involvement and motivating the workers to improve productivity and performance, the Supervisors still do not apparently get it, since results do not improve. Let’s blame them for the performance problems, right? No! Let’s look at task interference, our measurement and expectation systems, what we give feedback about from the management team (if asked about engagement once every few months, you can expect a focus on engagement every few months…). Why not try to make the Supervisors a bit less constrained and a lot more able to do what they want to do in regards to actively involving their people, building teams, solving workplace improvement issues and things like that? Why not look to FREE them up from some of those duties listed above. Let’s do away with performance appraisals (by any name) and let’s reduce the clerical burden. Let’s free them up from all the administrative minuscule and even give them some training. Let’s give them more skills and more confidence to use those skills through support from their managers. Let’s make them more like Facilitators than Bosses (since BOSS spelled-backwards is self-explanatory). There is no one simple way to do this; there are lots of ways to do this but we have to make the choice to make things happen. Look, the very brave supervisors already do this now, and you know who they are. They are the ones with the exemplary results. I mean, how else can you explain those results? Taking a quote from Conant, “Behold the Supervisor who, like the turtle, only makes progress when he sticks his neck out. For a number of years, we have been working with Solomon Salvis to deliver our team building and organizational development products in Asia and it is really great to have him come online with his new website. Now based in Singapore, he is expanding this teambuilding and leadership development work and product sales for that marketplace. Simurise Learning Solutions is my exclusive distributor, worldwide. And while any of our users can resell my products to their clients, Solomon’s expertise and exposure should make distribution and development much more interesting. Solomon is also a solid presenter and facilitator and is building his delivery and support teams to support a variety of workplace improvement initiatives and collaborative partnerships throughout the region. If you want a reliable supporter for your teambuilding or organizational development / experiential learning needs and are in the Asian Marketplace, my suggestion is to contact Solomon. And, we are in the midst of rolling out a special version of our game to HRDQ’s distribution channel as well as upgrading all of our materials with various LEGO® scenes to add color and more impact to the presentations and discussions. It continues to be a fun as well as most excellent journey to impact workplace collaboration and alignment. Debriefing Lost Dutchman’s Gold Mine is where we continue to mine organizational development gold. And there is plenty of gold to mine if we can act to do things more collaboratively and with better planning, alignment, and communications. People have fun playing the Lost Dutchman exercise and problem solving and even competing but when the sugar hits the fan in the debriefing, they realize how they missed the message of collaboration and optimization, and that they played well as a team but not so well as a group. And it is the overall group results that are most important — who cares who won if our overall success was sub-optimized? With that as a framework and because I am working up a new powerpoint debriefing toolkit for our game, my thought was to share a feedback mechanism that has a wide variety of constructs and applications for impacting accountability and collective engagement. Since I reference it briefly in the powerpoint, I thought to expand upon it in here for my general readers, customers and colleagues. It is a general tool for driving more active involvement and feedback, one you can easily adapt to any training program with a slight twist of metaphor. This message happens repeatedly in the introduction and this visual is printed on business card stock used during the debriefing. We give these cards out as a tool to reinforce the overall theme — note the WE, because the game is focused on optimizing overall ROI. Tabletops often choose to compete and focus on their own results and thus they do not collaborate much and focus on optimizing ROI for the group, the WE part of this is bigger than that tabletop. If collaborating, they can often improve overall results 20% or 30% with no other changes. If competing, they do not help the other teams improve their results. Pick someone in the room who you think could choose to improve their teamwork and give them a specific suggestion as to what they might do differently. Put their name on the top and an actionable idea in the body. You can be anonymous if you wish. Select one good idea from what we discussed and write it on the card. We will collect the cards and summarize the ideas back to you as part of our followup. Give ME (the actual company Expedition Leader and not the exercise facilitator) ONE GOOD IDEA about what I should do differently to help our organization improve its performance. It can be signed or anonymous but please make it valuable! Write down one good idea that you want to implement in the next couple of weeks and put that card into your wallet. Expect an email from me on (date) to remind you to look at your card and see if you have been able to accomplish that idea. The cards are thus a flexible tool for getting one more behavioral commitment to apply to the group dynamics, and followup is certainly the key to installing any kinds of organizational change from a training results. The cards can be randomly collected or the collection assigned to the Team Leader for gathering so that you can get a card from each player. 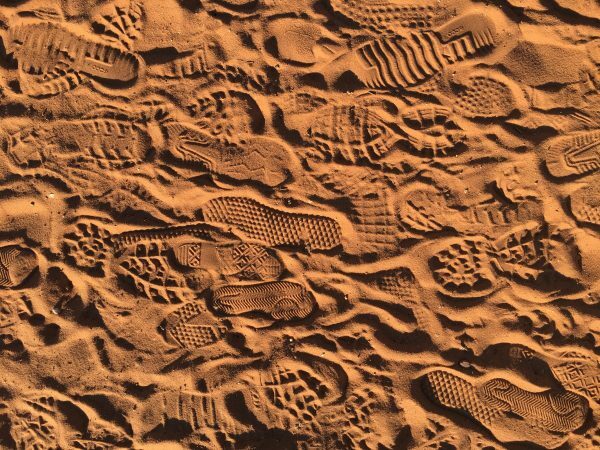 If everyone contributes, it generates a bit more social pressure to actually do something differently; it is one more grain of sand on the scale of commitment. The idea is to use these cards to stimulate thinking about specific desired behaviors that can be changed or improved and that would have impacts on the collective, on the entire group so that it can operate more better faster to improve overall results. I generally post up pretty complete thoughts and frameworks but this one is more of a blurt. If you want me to do more of these, pass the word. And I think that employee engagement ties solidly onto the tail of trust, in that you need to feel that there is a peer-group safety net to take the risk of showing that you care about the job and about the organization in many organizational cultures. Maybe we need to look to do something differently. I mean, does this REALLY need much in the way of New Thinking to generate some alternative behaviors in most workgroups? Is this a Training Issue, or could people simply CHOOSE to do things differently? Don’t Just DO Something; Stand There. Scott’s blog on themes of People and Performance is here. Client: We are having an offsite for our leadership team. They all work in silos and there is a trust issue. We want to communicate to them that they should all trust each other and work together. Only then we would be able to achieve our roles. Me: Why do not you tell them that? Client: We want a facilitator to bring these issues subtly and indirectly. Our CEO does not want to address this directly. May be you could do this through some games or activities. We are also talking to couple of other organisations like yours and want to see who offer the best solution. Me: I took leadership team of a client three times in two years to Rishikesh and to address trust and silo issues I made them do whitewater rafting. They enjoyed the rafting. After two years I learned that they became very good in rafting but the trust issues remained. So no indirect approach to the trust and silo issues. I will pass this opportunity. Lets work together some other time. Well, duh! Really. People on this executive team actually expected that a consultant-led raft trip would improve corporate functioning? Why do we experienced consultants somehow believe that a paintball or lasertag event, or a Firewalk or go-kart race is going to transfer anything to the issues of improving organizational performance results? We see people learning how to crew an 8-oared rowing shell, or learning how to climb and rappel, or even going parachuting or hang-gliding. Neat! Fun!! But real teambuilding? Why not choose to do team building to accomplish team building? We just reached our 25th anniversary of selling The Search for The Lost Dutchman’s Gold Mine teambuilding simulation. You can see a Press Release with details here. And we will guarantee that using the exercise as designed will generate solid discussions about what specific changes need to be generated it one follows the suggested line(s) of debriefing to link to issues and opportunities. You WILL generate discussions — and what you choose to do subsequent to that program will drive the implementation of results. One of the best teambuilding exercises in the world, as rated by his users, is The Search for The Lost Dutchman’s Gold Mine, which focuses on leadership, collaboration, alignment and focuses on implementing the collective performance optimization ideas. He is also known for his Square Wheels® approach to innovation and engagement. 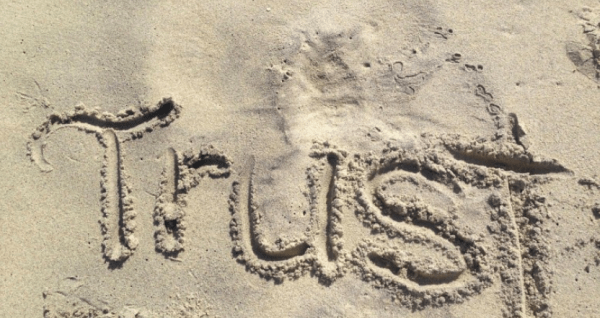 All it takes is a gust of wind to change things and we need to be reminded that trust is something we need to maintain, not just do once in a while. We should also be reminded and mindful about the diversity of people within our organizations and about the reality that all of us know more than any of us when it comes to generating ideas and engagement for improving workplace performance. Here at Performance Management Company, we sell simple tools for impacting teamwork (Vio at HumanInvest has our Lost Dutchman game in English and Romanian) as well as impacting innovation and motivation. We suggest that leaders work to actively involve their people in generating ideas for improvement and facilitating creative problem solving as well as generating alignment and collaboration. We also have a simple online facilitation skills training course and toolkit (really cheap and highly effective!) at The Square Wheels Project. If not you, WHO? If not now, WHEN? I love that short little quote about personal accountability and action. Of course, we can always wait for someone else or we can simply choose to wait, which tends to be the most common response of people to opportunities. Lots of statistics point to the small numbers of “early adapters” of new programs or organizational change efforts while the bulk of managers simply sit and watch to see the results. But, if things are going to change, someone needs to make them change. 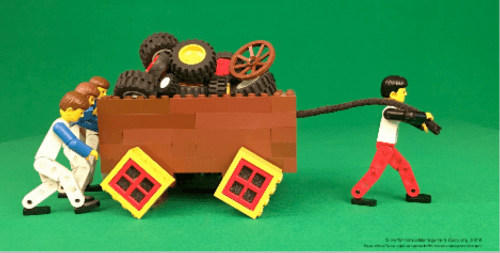 Most wagon pulling leaders work hard, pulling the wagon and trusting that the measurements and expectations and performance appraisal mechanisms will insure that the people at the back are pushing instead of pulling. After all, what choice do they have? So, they simply keep pulling, hoping that things will always be okay. But let’s challenge these assumptions. Let’s assume that day after day, month after month, year after year, all this gets really old and somewhat de-motivating. New hires become dis-engaged over about 6 months and regress to the average enthusiasm of the other workers even as their skill levels increase. And, the good workers will tend to blame their wagon pullers for a lot of the communications issues. • 35% of US workers would forgo a raise to see their boss fired. • 3 of 4 workers say that their boss is the worst / most stressful part of the job. This all begs the question of what might be done differently to generate improvements, basically, The Who and The When. DDI recently shared some statistics that suggested only 11% of supervisors get management training. So, we can guess that support for skill development will not be coming soon from Training and Development / HR. Nothing new there… They simply have other priorities. The reality is that people will continue to come into the workplace dragging. And if nothing changes, nothing changes. They are, for the most part (70%), un-engaged, un-enthused and un-involved, and the best predictor of the future is the past. So, who other than their supervisor can change things? How can that supervisor become a Draggin’ Slayer and choose to do things that might DIS-un-engage them and generate some active involvement around identifying the Square Wheels® that exist and the Round Wheels we always find inside the wagon? Which, when facilitated with active questioning and group involvement, can begin to break the ice around communicating about issues and opportunities. It is NOT instantaneous in some workgroups where there is hostility of a lack of trust, but it DOES work if we keep asking questions and responding positively to the initial ideas. The process itself is pretty bombproof. Having been around corporations and other businesses for 35 years, I actually see NO real solution to the issues we face in motivating and involving workers other than through the direct actions of supervisors. Operations have always been this way; exemplary performers doing things differently than everyone else and exemplary supervisors choosing to defend their top performers from “corporate bureaucracy” — and simply managing people better. The best managers have always gotten people talking about Square Wheels and playing with Round Wheel ideas for improvement. We simply cannot go #morebetterfaster if we continue to do the same things the same way and wait for help from above. It just is not going to happen! Our better managers ask questions and solicit ideas from their people, generating motivation and innovation. You simply cannot drive this from a tops-down approach since you can never reach the people who are doing the work. If you can share a more effective or impactful approach to involving and engaging people in the workplace, why not contribute a comment? Workers DO have ideas about improving their workplace and impacting quality and productivity. Working together can foster teamwork and peer support and many of the other intrinsically motivating aspects linked to accomplishments. Building communications and trust between workers and managers is an important factor in employee retention and skill development and cascades into innovation and service quality and customer retention. We offer a SIMPLE toolkit for facilitation skills development at The Square Wheels Project. For a tiny bit of money, supervisors can gain access to an online course and also the powerpoint and handout sheets needed to have a productive and engaging meeting (or meetings, actually) with their people about issues and opportunities for workplace improvement. If we can encourage our supervisors and managers to think differently and go off on their own paths to improving involvement and engagement and motivation of their people, is there really any downside? I guess you could call this empowerment. But how else are we going to take advantage of our human capital and go #morebetterfaster? The managers should be the motivators. I was reading an article on adapting things like HomeKit and Echo into the way people interact with their homes. Alexa is pretty cool, but there are issues around its inability to recognize voices and there have been instances of voices on TV actually telling the system to order products online and the reality that a burglar could simply tell the system to turn off security alarms. The point that author Seyi Fabode was making was that one of our most basic needs is for security and safety, both at home and in the workplace where so many of us spend so much time and emotional energy. MY thinking about his thinking was framed around a workshop I attended by Brad Thomas with my local ATD group yesterday morning. Brad was focusing on the implementation of full-company engagement systems and his excellent talk was anchored somewhat to these local issues but mainly focused on the corporate commitment to generating and acting on large amounts of employee feedback to frame up issues and opportunities. In that Big Picture Corporate Model, things needed to cascade down from the top and that HR departments had to rethink how they focused so that they could actually bring human resource capital into play for their operational counterparts, that they could not simply remain the paper pushers they are in so many places. HR needed a seat at the corporate boardroom table to focus on the people side of improvement initiatives. It seems like an awful amount of senior management engagement and systemic change was a requirement before ANY actions could occur. Have a conversation with someone who works in an organization and ask about how they feel they are being managed. I had two such conversations with people in my pool league two nights ago. Absolutely eye opening! So, what IS a viable solution? Understand that the Big Corporate Improvement Program Initiatives seem doomed to fail unless organizations impact that supervisor / worker interface and make it more supporting and effective. And you can probably figure out that working to engage workers working for the 1 in 7 managers who are actively DIS-engaged within their own organization is simply a waste of money and resources. Throw some mud at the wire fence! Break away from the Big Corporate Program Mentality and do some Guerilla Engagement. Give some of your better supervisors the tools they need to improve their effectiveness. Allow them to improve their interactions with their people and to improve their facilitation and involvement skills. 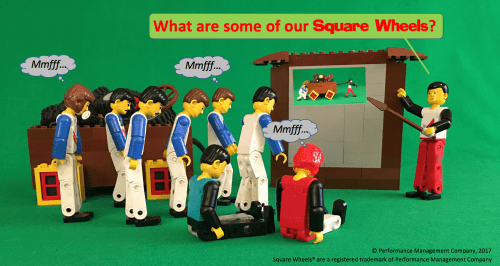 The Square Wheels Project is an online training program designed FOR SUPERVISORS who need some training and some tools to improve communications. The Spring Forward Monday Toolkit is a package of tools (handouts, powerpoints, posters and instructions) to give supervisors the framework for a series of meetings and implementation action plans for simple ideas for workplace improvement and innovation, to allow more teamwork and active involvement. The Square Wheels Project is not THE Solution to anything, but it does represent a most excellent alternative to the initiatives that are generally not working very well, a step forward in the effort to improve communications. But some facilitation skills training can certainly help your managers to become better motivators and better leaders. Help them lead on-site workplace innovation and improvement initiatives at the very bottom-most layer of your organization, where most things are actually happening. Do things differently and let them lead! Solve the small problems in simple ways, keeping a sense of safety and security in place with your supervisors feeling a minimal amount of risk for doing something differently. Look for some “small answers” to local issues and build things from the bottoms up. Make real improvements where you can, instead of looking for Big Answers from a distance. Addendum: Since initially publishing these thoughts, I have begun to focus on a framework of Disruptive Engagement, which takes in much of this thinking and adds more data and rationale. You can find those blogs by clicking on the two images below. So, with most people dragging, and this to be a known problem, why not choose to do something differently? Why not recharge their batteries and increase involvement (known to be low in general) and motivation (generally low) and teamwork (sometimes very spotty) by having a meeting focused on their issues and their ideas for improvement? Choose to be a Draggin’ Slayer. Seize The Day! Choose to focus on rebuilding some energy and gaining ideas for improvement. You can probably expect some low energy from your people. 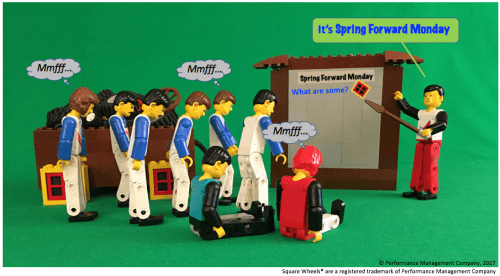 But our experiences show that this will be short-lived as people get involved with the Square Wheels® metaphor as a vehicle to discuss issues and problems — and there are lots of Square Wheels out there! Simply talking about perceived Square Wheels will generate many Round Wheel solutions to make things roll more better faster. People want to make improvements and people will work on teams to look at the ideas for improvement and offer ideas for implementation. It is just that they need the collective thinking of the group to really understand the issues more clearly and to better define some solutions. Nobody ever washes a rental car. So, it is about choice. Your choice to simply continue to do things the same way or to involve and engage your people to look at things from different perspectives and define some issues and refine some ideas for workplace improvement. This kind of session can be held at the front-line worker level or even among the top management team, although workplace realities would suggest that the people pushing the wagon know a lot more about the realities and problems than the wagon pullers. Most organizations do have the tendency to work like this and we will note that our experience proves that the Round Wheels are already in the wagon — those good ideas already exist. It is simply a matter of identification of the better ideas once the bad ones are recognized for what they are. Square Wheels® One is our main illustration about how things really work. So, with that perception about how things really work, you can use your imagination to guess at what might be done differently. You can choose to be a Draggin’ Slayer on Spring Forward Monday™ or continue to let things thump and bump. You can choose to improve involvement and engagement by involving and engaging your people in a new vision of how things can roll to the goal. People WANT to be involved. Even the ones that say they don’t will get involved and engaged, since they so-often complain about how things are working and this is the perfect venue for them to contribute! So choose to involve everyone. Let people make some better choices and own the process of implementing workplace improvement. If we have gotten you interested, here are some simple resources. One is a 2-minute video overview of the whole idea. 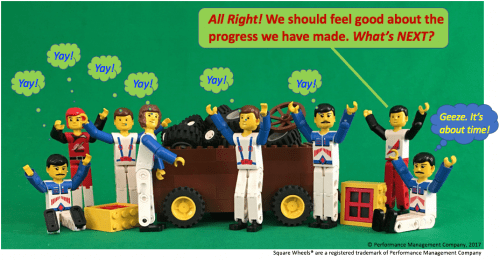 A collection of Square Wheels Posters that can be used as anchors to the insights gained as the group rolls down the road. And, you can access The Square Wheels Project to complete a 30-minute optional course on facilitating workplace improvement through facilitation. It is a general course, but focused on our metaphors and worksheets. And it costs only $10 as we gain traction for our approach to organizational performance improvement and motivation of workplaces. We are working hard to make this simple tool available directly to supervisors and managers who need simple and effective tools for motivating their people. Doing this on Spring Forward Monday™ would be a nice touch, but doing one of these sessions any time would be impactful. Then, I got to thinking about that first word and if it might be better if I made it more general and changed it to people, since it also applies to children and it did not have to be a workplace poster. So, I put up a “which one” image of both in Facebook and the resounding response was PEOPLE. People agree that PEOPLE can grow and that employees are people, too. Now, I wish that more organizations will make that simple realization and behave to better involve and engage them in alignment to goals and objectives and provide them with the feedback and support and teamwork that would allow them to grow and perform at a higher level. The data suggest that people are disengaged and often unmotivated. Extrinsic rewards are not driving high levels of overall performance and interdepartmental collaboration remains an oxymoron. Supervisors are the fulcrum for changing behavior. HR and T&D simply cannot impact people who are doing the jobs at hand. We must improve supervisory skills and facilitating involvement is straightforward – Ask and Receive. But few supervisors seem to be listening, or even respecting their people based on many different surveys of attitudes and behaviors in the workplace. So, give them some sunlight and some good soil and watch what happens! 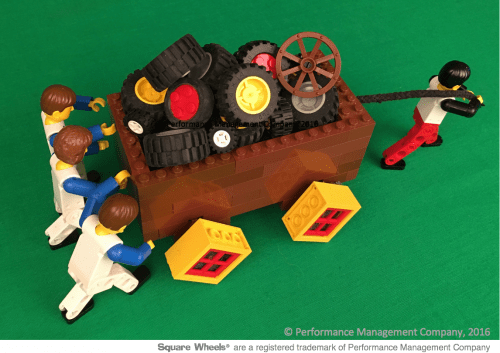 The Square Wheels Project is an LMS designed to teach facilitation skills to supervisors, using the Square Wheels metaphor for organizational performance improvement. 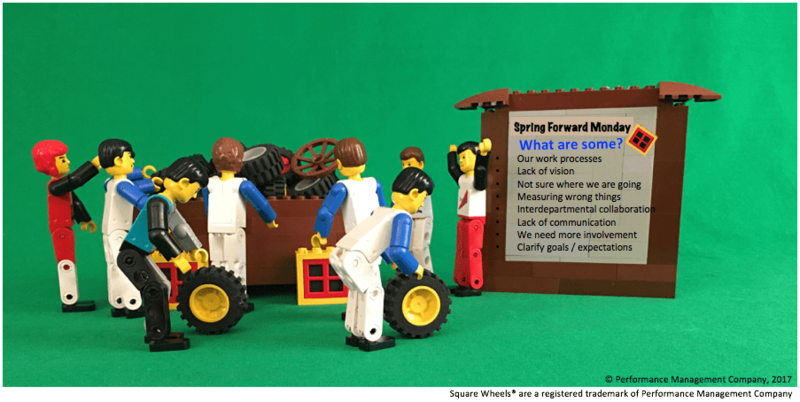 The theme is simple, Square Wheels describe how most organizations and most processes really work and the Round Wheels already exist, in that the people at the back have the hands-on experience with moving forward and know what can be changed and improved. The idea is to enable to conversations, which is what the short course is designed to accomplish. is a lot like herding cats. It is possible to accomplish that, but with me with an 8-month old uncontrollable and insane kitty and with me working on Robin Speculand’s Compass Model for workplace strategy implementation (and seeing lots of statistics around failures and challenges), I am once again reminded that the metaphor links to many issues of workplace engagement and alignment. Funny stuff, for sure and worth watching! My British friend, Barry Howell, used the phrase “herding frogs,” in a conversation, which got me into expanding my thinking. Not everyone in the workplace is a feline, which of course makes things more difficult to manage, right? Herding frogs seems to be a more common metaphor there, maybe because they aren’t so much into herding cattle as in the US. So, what does herding frogs look like? Here is a video of The Great Frog Capture in California. Do NOT try this at home! kinesthetic phrases to anchor reality. Then, I saw a link to an absolutely wild short video about stampeding ducks. Seriously. Click on the image and be amazed. And again, do not try herding ducks like this at home or at work! The only issue that I would have with workplaces is that there would be little innovation and few people doing things differently. You would not have exemplary performers in any real sense. Plus, herding sheep is not workplace reality, for sure! Trying to implement change and improvement and motivating people is not an easy task, as shown in the above examples. And while ducks will be imprinted to follow an individual or other ducks and sheep are naturally herd animals easily controlled with a few sheep dogs, managing people is simply not so easy. People ARE creative when we allow them to be. People are great problem solvers if they recognize something as an issue. And people need leadership. We need to have the time and energy, as leaders, to deal with the new baby elephants! We cannot simply add one more thing on top of all the other things and expect it to be given the attention it needs. Most strategy implementations fail not because of a poor strategy, but because the implementation plan does not prioritize that implementation nor take into account all the time and energy needed to get things to be different. Plus, while it seems easier simply to tell people that they need to do things differently, that behavior generally results in active resistance by many. We need to develop alignment, teamwork, collaboration and a sense of ownership, along with prioritizing the time and effort required, in order to move people to different performance places. Cats, frogs, sheep and elephants. Will Herding Zombies be next? Solutions are not simple. But you may find our approach to involving and engaging people for workplace improvement to be pretty straightforward. We share some simple tools for involving and engaging people for improving workplace performance at The Square Wheels Project. Using our Square Wheels images and themes and facilitation approach, you can generate alignment to shared missions and visions, ask about issues and opportunities and define strategies to implement and manage change. Check it out!